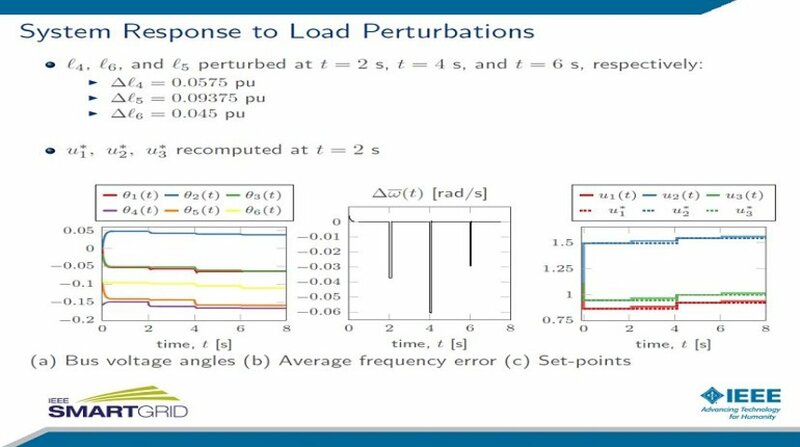 This talk discusses the problem of frequency regulation in islanded ac microgrids with no inertia, i.e., those consisting entirely of generators interfaced through power electronics. The control architecture we propose to achieve this is designed to drive the average frequency error to zero while ensuring that the frequency at every bus is equal and that the operating point that results is stable. We also introduce a distributed implementation of the proposed control architecture that relies on a combination of several distributed algorithms. Two of the algorithms, which are well-established consensus-type algorithms, allow the generators and loads to acquire global information needed for making control decisions; the third algorithm, which we propose herein, enables the generators to obtain output values that balance the total demand for load without violating line flow constraints. Collectively, these algorithms eliminate the need for a centralized entity with complete knowledge of the network, its topology, or the capabilities or properties of the generators and loads therein. Moreover, the distributed implementation we propose relies on minimal measurements, requiring only that the power injection at each bus be measured.